As a parent, I like to think that I can teach my children important life lessons from the safety and comfort of our living room, shielding them from the pain of learning those lessons from real life. The danger in this is, of course, the best lessons are always learned the hard way. Those that stick with you usually come from a scar that is left behind as a reminder to your seasoned heart. Several months ago, Keller came home excitedly talking about his favorite teacher forming a garden club. He and several friends decided that they would join and from that point forward, it was a passion for them. 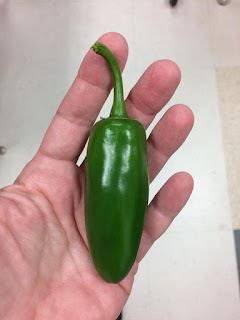 They discussed what to grow, read about how to grow it, cleared out the garden beds and planted. They patiently waited for the first signs of life from their new hobby, often dedicating their recess time to work and pull weeds rather than play. Over spring break, Keller was insistent that since we lived closest to the school, we needed to check on the garden because going for a whole week without care was unacceptable. He even carried a full jug of water as we walked the half mile from our house to the school because he was unsure there would be a source to get the water once we were there. The boy was all in. When Keller got to school yesterday, he was greeted by a friend who promptly asked, "Have you heard about the garden? You should go out there." When he got out to the garden, he joined a brokenhearted group of friends and together they gained a scar. Someone had vandalized their garden. 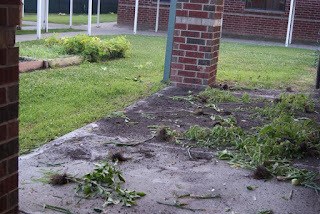 Every plant had been violently ripped from the ground, thrown and scattered around the school yard. 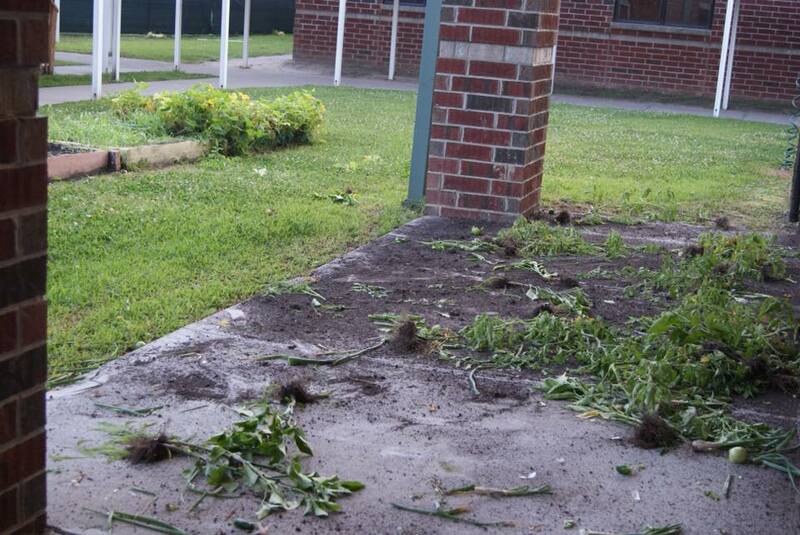 The tomatoes had been smashed and thrown against the windows of the school. It was total devastation. With tears and a broken voice, he was telling me about what happened when I picked him up yesterday. As he talked, my anger grew. I wanted to know who did this. I wanted them to be punished. I wanted them to know how much sadness and pain they had caused a group of amazing kids and their sweet teacher. Before he was finished, I was devising a plan to root out the vandals and make them pay. But this isn't a story of destruction and vengeance. This is a story of grace. When those kids saw months of hard work and dedication laying before them as waste, of course they were upset. Rather than wallow in pity and devise a plan to punish those responsible, they went to work. They tenderly started picking up the plants and deciding which ones may be saved. Carrying them like newborn babies, they gently replanted and watered them, propping up the broken stems as much as possible. After they replanted, they cleaned. They didn't have to. There were fun activities planned for them for the day but they knew there was hard work to be done. They borrowed soap and rags and scrubbed dried tomato from the windows of nearby classrooms. For two hours, they cleaned up the mess that was meant to destroy and made it beautiful again. In the end, their pain was less evident than their love. Their garden may not survive but this beautiful scar will and they are better for it. We all are. Before he was done giving the details of their morning, my heart was changed. Their response changed my response. Their hearts changed my heart. Their grace, kindness and love were so big that my anger was eclipsed. Now, I could only see grace, kindness and love. Overwhelming love. Some days, I tend to narrow my focus on all the turmoil around me. Everything looks broken from this vantage point. I want to demand punishment for every wrong and justice for every hurt. What would happen if I focused instead on Love? Life is full of difficult seasons. Just as I want to protect my children from learning them the hard way, I've always prayed that God would let me learn them from the comfort of my own safe life, watching others go through the hard parts rather than experiencing the scars for myself. This is, of course, impossible. Rather than try to avoid the scars of growth all together, I need to change my response. I want to open my arms and accept them with love, knowing that those scars will produce something beautiful in my own heart. I want to allow Jesus to look around at all of the broken pieces of my life, scattered like trash and left for ruin, gently pick them up and make them beautiful again. He can do it. He will do the hard work of putting us back together, propping us up and making something beautiful from the brokenness and devastation.